Earlier this year book piracy surged after the introduction of the iPad. Although some publishers and authors fear that this will cause their revenues to dwindle, there are plenty of signs that the opposite will happen. This week, comic book writer Steve Lieber said that his sales went through the roof after pirated scans were shared on 4Chan, and he's not alone. This year has seen the definite breakthrough for digital books, which led to mixed feelings among publishers and authors. On the one hand digital distribution makes books more accessible to the public, but the downside is that unauthorized copies can also be shared more easily. Looking at the music industry, some publishers are fearing the worst, but the million dollar question is whether or not these fears are justified. How big of a threat is eBook piracy for the book industry? Or is it an opportunity instead? This week comic book writer Steve Lieber has shared his experiences with book piracy, proving that it also has its benefits. Lieber noticed that scanned copies of his graphic novel Underground were posted on 4Chan, but instead of putting his sales to a halt, they skyrocketed. Lieber shared his findings in a blog entry, complete with fancy graphics which show that the 4Chan piracy resulted in a flood of new customers. 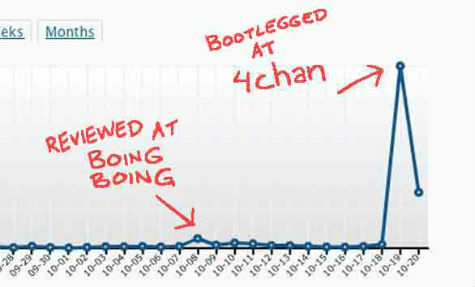 The picture above shows how Lieber’s site traffic surged after the pirated scans were posted, and how 4Chan brings in more traffic than BoingBoing. But Lieber also said that the spike in sales was even more impressive. It would of course be naive to claim that this example proves that piracy is not going to affect the book industry in a negative way, or that it will boost sales for everyone. However, it does show that ‘being noticed’ can do wonders in individual cases, even if it’s through piracy. And that’s not the only benefit. The availability of unauthorized copies doesn’t only help writers who have yet to gain an audience. Well established authors have also noticed that piracy can do wonders for sales figures. Bestselling author Paulo Coelho has previously shown that giving away free digital copies of books can actually boost sales to quite an extent. He claimed that this ‘piracy’ has led to millions of additional sales over the years. Coelho, who is an avid BitTorrent user himself and a passionate supporter of The Pirate Bay, has encouraged many of his fellow authors to share their work. “A person who does not share is not only selfish, but bitter and alone,” Coelho told TorrentFreak. Even more so, according to the anecdotes above an author who doesn’t share might actually miss out on some additional revenue.